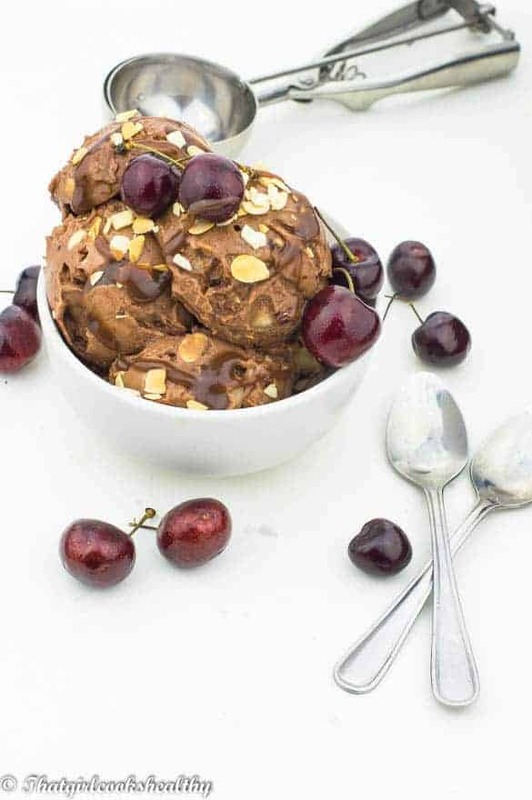 Cherry chocolate ice cream – Impress the one you love this valentines with this raw, vegan style cherry chocolate combination ice cream made with a banana base. I’ve been wanting to make another raw vegan ice cream for a while now since I successfully made two other dairy free ice cream recipes. In case you missed them I will cite them here raw banana ice cream and I also made this blueberry ice cream .Both recipes were well received on the blog with positive feedback too. If you haven’t tried those recipes, I would highly recommend giving them a try. With that being said, although it is not officially cherry season just yet. I couldn’t resist purchasing some from my local grocery store. I saw the prettiest bright red cherries which were waiting to be brought. If you’re a cherry fan like me – outside and in season. You can find cherries for a reasonable price at the groceries. I like to hand pick mine and purchase the exact quantity I need. 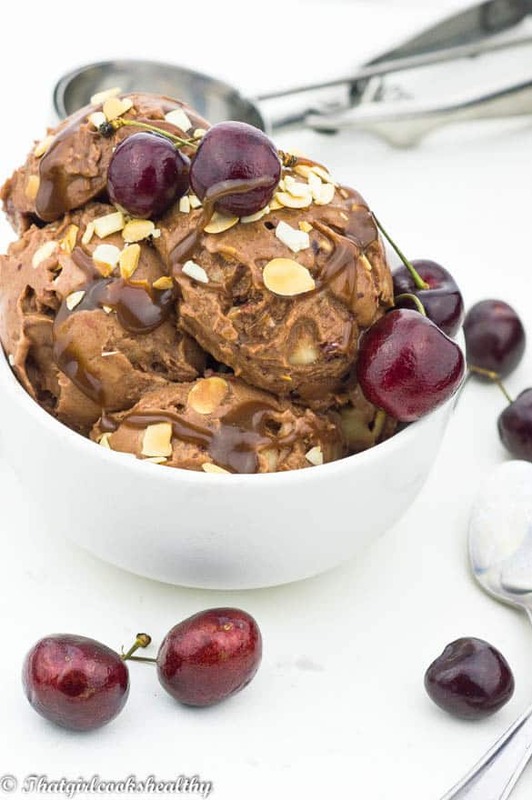 Chocolate and cherries are a great combination and one which is underrated. For valentines day most people will probably play it safe with flowers, chocolate, candy and/or a meal at a swanky restaurant. While these gestures are nice and really sweet, sometimes it’s nice to do something different. I adore homemade crafts and food that’s made from scratch at home. Ironically, so many other people feel the same but may feel societies pressure do something more materialistic for valentines. 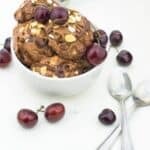 If you’re in the aforementioned category then I have you covered with this cherry chocolate ice cream recipe. It’s very simple and fits in with “red and black” theme for V day. In fact you can eat this ice cream in time of the year but make it extra special for the one you love on February 14th. The base of the recipe is made from frozen bananas. I love adding frozen bananas to my smoothies so I always have some frozen banana pieces in a zip lock bag to hand. You can’t make the ice cream without frozen bananas. Keep in mind, the frozen bananas are the most important aspect of the recipe. However, the cherries don’t require freezing I simply pitted and added them to my food processor. Of course since this is a vegan recipe a heaping tablespoon of cacao powder was included for that chocolate edge. The blanch split almonds were great for that nuttiness and that extra crunch. 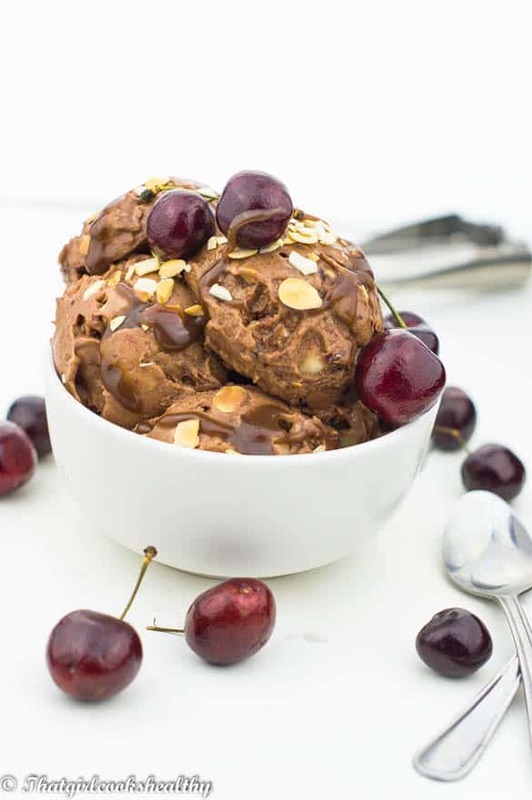 This is perfect vegan chocolate ice cream with the cherry on top! Continue to pulse until a smooth ice cream consistency appears, don’t worry if all of the banana pieces don’t turn smooth, just as long as the major does. You don’t want to over process or the consistency will melt too quickly. 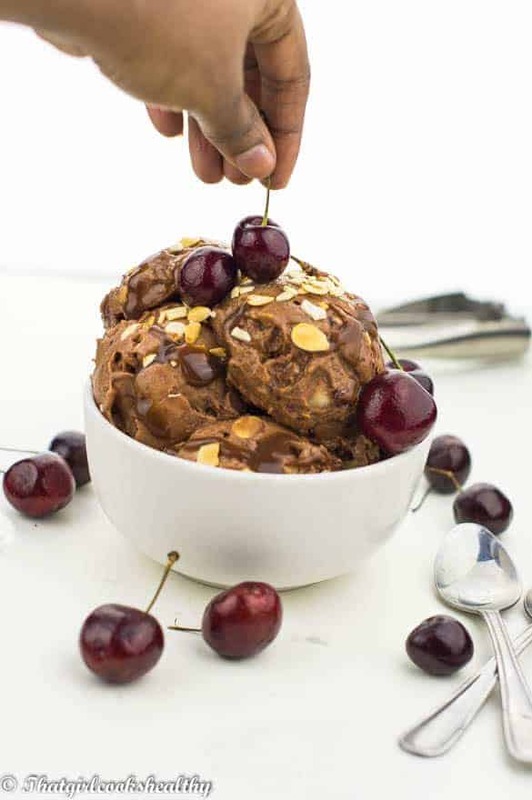 Sprinkle the rest of the almonds over the ice cream and serve with optional chocolate sauce.